It’s that time of the year again. The newest iPhones are being released to the world tomorrow. The iPhone has become one of the best selling and more importantly, most loved smartphones ever. Each year Apple makes enhancements to the iPhone which makes us stand in queues and buy the product which we need most in our lives. Multi-touch screens have become essential to the way we interact with our smartphones. The iPhone 6s has a new screen which adds the ability to interact with it with much more functionality. 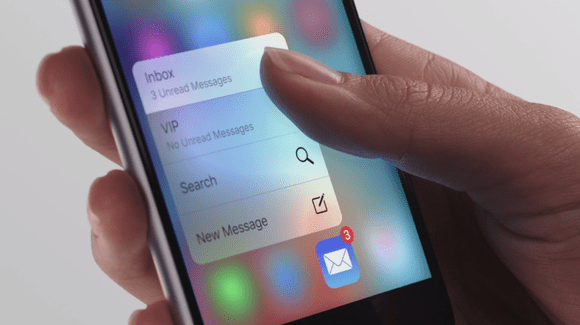 3D touch is a new technology which enables the iPhone 6s to recognise how much pressure you are applying to the screen. This will revolutionise how you use your iPhone and make your experience much faster and efficient. There are 3 types of pressure which enables you to interact with your iPhone’s screen..
Live Photos is a great new feature which brings your photos to life. When taking a photo your iPhone 6s instantly records 1.5 seconds of video either side of your photo which creates a short video. This enable you to relive the moment when you took that picture. This picture can be used as a wallpaper, so when you turn on your iPhone screen your wallpaper comes to life. If you have an Apple Watch, you can use Live Photo pictures to use as your watch face. This feature will create priceless moments for you. With the improved 12 megapixel camera that the iPhone 6s boasts, you can now shoot 4K quality videos. This will enable you to shoot videos with the highest quality. With 4 times the resolution of 1080p HD your 4K videos will never look better. Also with the feature of a front flash option, you can guarantee you won’t be taking selfies in the dark anymore. The front facing camera has been upgraded to a 5 megapixel camera for great quality FaceTime calls and selfies. Along with iOS 9, these are the key new features that make the iPhone 6s what it is. The design may not have changed much but the interior along with these killer new features, the iPhone 6s is predicted to the the best selling iPhone ever.